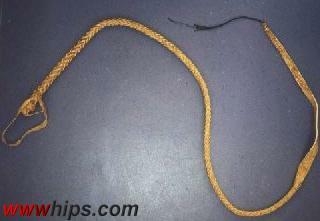 Cattle whip made from a single piece of cow rawhide. The handle is stiffened with a rawhide core, the rest of the whip is plaited without core, beginning at the point. Heavy construction, not for cracking but made to hit. For testing I attached a cracker - the whip cracks easily.